Ray-Ban updates the classic aviator and the end result is astonishing. Bold, clean, and stylish, this pair of sunglasses has a durable propionate frame with 100% UV protected lenses and for a winning finish, the temples are decorated with petite and polished logo detailing. Ray Ban is a high end manufacturer of sunglasses, founded in 1937 by Bausch and Lomb, on commission of the United States Air Force. In 1999, Bausch and Lomb sold the brand to the Italian Luxottica Group. Ray Ban was responsible for creating two of the most imitated sunglass models on the planet: the Ray Ban Aviator and the Ray Ban Wayfarer.Timeless, authentic and imaginative, the Ray Ban collection remains true to its classic heritage, while continuously evolving to meet todays fashion demands. 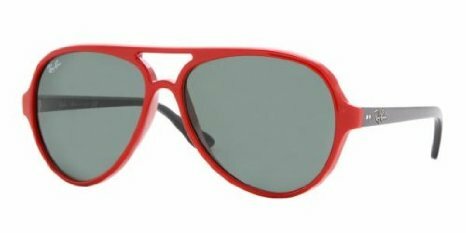 Ray Ban sunwear provides timeless style with models like the classic Wayfarer and Aviator while also offering exciting new styling innovations in keeping with todays contemporary urban fashion. Nationwide, Ray Ban is recognized as the eyewear brand tha America loves.